The parking aid is not a substitute for the driver paying proper attention and it is always the driver's responsibility to take care when reversing the vehicle or carrying out similar manoeuvres. Pay particular attention to small children and animals as they are not recognised by the parking aid sensors. Before reversing, you should make sure that there are no small obstacles, such as rocks, thin posts, trailer drawbars etc. behind your vehicle. Such obstacles may not be recognised by the parking aid sensors. Under certain circumstances, surfaces of certain objects and types of clothing cannot reflect the system signals. Thus, these objects or people who wear such clothing are not recognised by the System sensors. External sound sources can have a detrimental effect on the system. Under adverse conditions, this may cause objects or people to not be recognised by the system. If a warning signal sounds for about 3 seconds after activating the system and there is no obstacle close to your car, this indicates a system fault. Have the fault rectified by a specialist garage. The sensors must be kept clean (free of ice, etc.) to enable the parking aid to operate properly. Under adverse weather conditions (heavy rain, water vapour, very low or high temperatures etc.) system function may be limited. Additionally fitted modules, such as a bicycle rack, can impair the function of the parking aid. The parking aid (referred to below solely as system) only works when the ignition is switched on. The system supports the driver via audible signals, via the display on the radio or via the factory-installed navigation system when parking and manoeuvring » Radio user guide, Navigation system user guide. The system uses ultrasound waves to calculate the distance between the bumper and an obstacle. 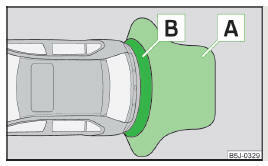 The ultrasonic sensors are integrated in the rear bumper. The clearance warning begins at a distance of about 160 cm from the obstacle (area A » Fig. 113). The interval between the warning signals becomes shorter as the clearance is reduced. A continuous tone sounds from a distance of approx. 30 cm (area B ) - danger area. You should not reverse any further after this signal sounds! On vehicles with a factory-fitted towing device, the border of the danger area starts (continuous tone) 5 cm further away from the vehicle. The length of the vehicle can be increased with an installed detachable towing device. The system is activated automatically by engaging reverse gear. This is confirmed by a brief audible signal. The system is deactivated by disengaging reverse gear. The system cannot be activated on vehicles with a factory-fitted towing device when towing a trailer.